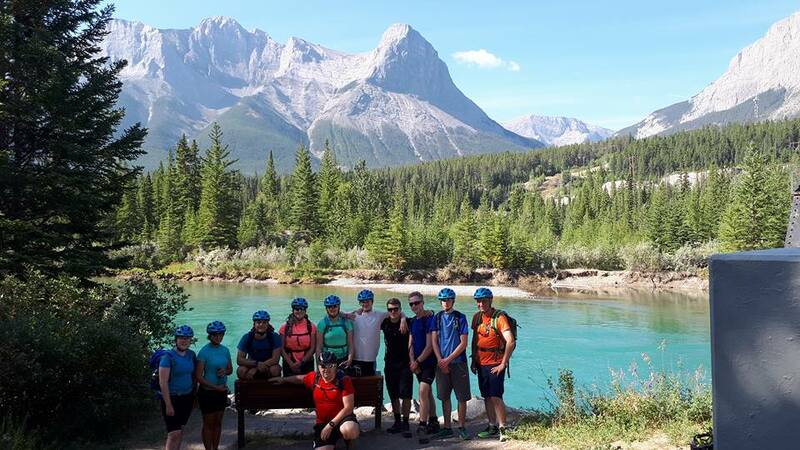 Staffordshire and West Midlands (NS) Army Cadet Force deployed a 24 strong expedition to Alberta, Canada to conduct Mountain Biking, White Water Kayaking, Mountaineering and Caving. So how did we achieve these outcomes? The expedition departed from MOD Stafford on a mammoth 22 hour journey arriving in Calgary in the late afternoon of Sat 19 Aug. We collected hire vehicles and headed to Hostel Bear, Canmore which was to be our home for the next two weeks. 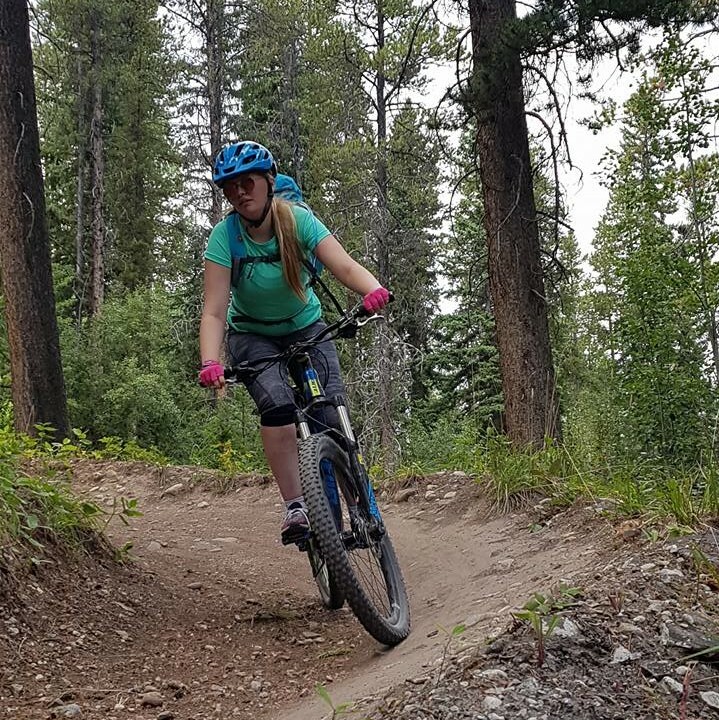 The second group headed to Gear Up the local bike shop to hire mountain bikes before hitting the single track mountain trails at the Nordic Centre. This was a great chance for everyone to stretch their aching legs after being cooped up travelling for the last day or so. It also set the scene for the rest of the expedition, physically very challenging, requiring mental strength, team work and self-discipline to overcome the many hardships that were to come. The next eight days were spent kayaking and mountaineering, four days of each. To develop skills and ensure everyone was ready for the fast flowing rivers we spent our first day on Grassi Lake honing skills and practicing rescue techniques that would come in very useful during the days that followed. 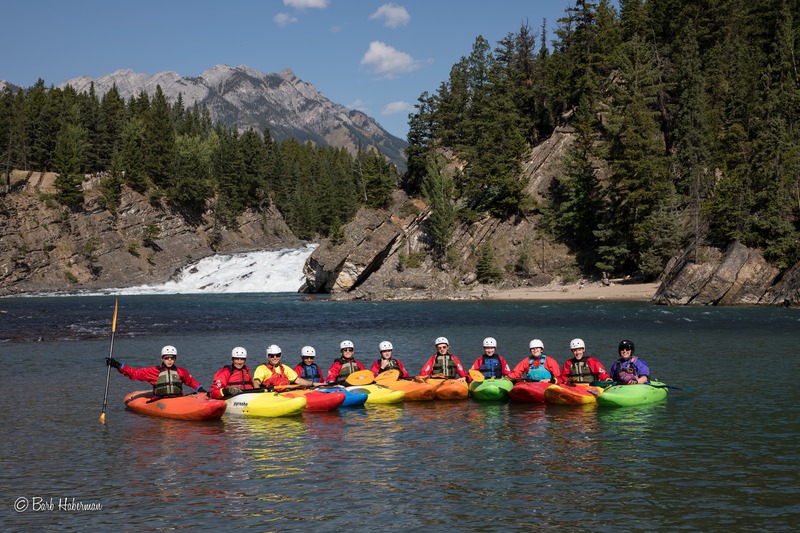 Day 2, the group travelled to Banff where they explored 23km of the grade 1-2 Bow River, they launched beneath the famous Bow Falls before meandering through stunning scenery afloat the fast flowing river under the watchful eyes of nesting Osprey’s. The many wave trains, stoppers and eddies provided excitement and lots of wet fun all the way to Canmore. 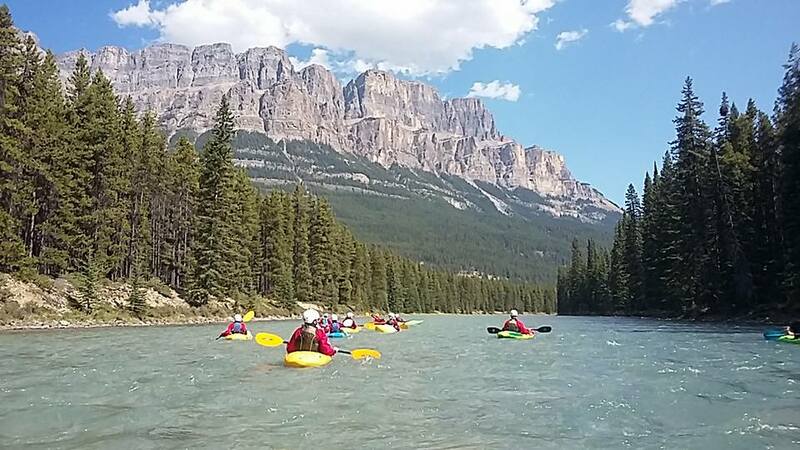 Day 3 continued on the Bow River paddling a further challenging 22km, Grade 2 section from Lake Louise to Castle Junction in the shadow of Castle Mountain. The river is fast and wide providing many opportunities for the Cadets to use their newly developed kayak skills surfing waves, breaking in and out of the flow, ferry gliding across the river and of course testing their rescue techniques on each other. 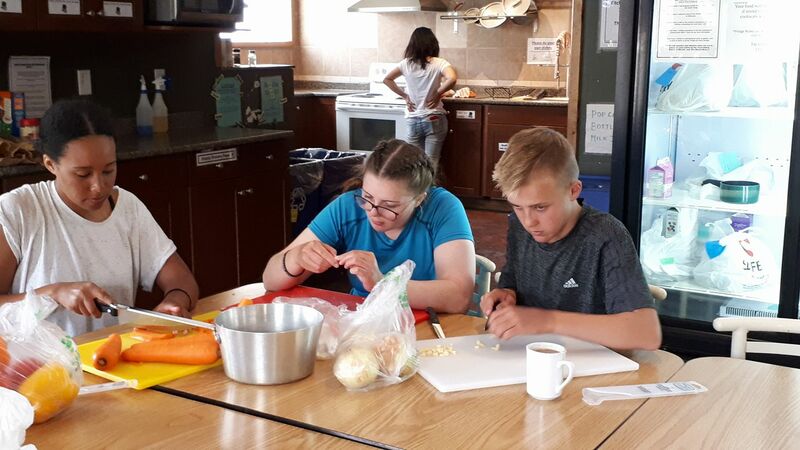 Signs of fatigue and tiredness were affecting a number of the group, it was clear that they are not accustomed to such physically demanding activities with the added work load of personal admin, purchasing food and preparing meals for the whole group. 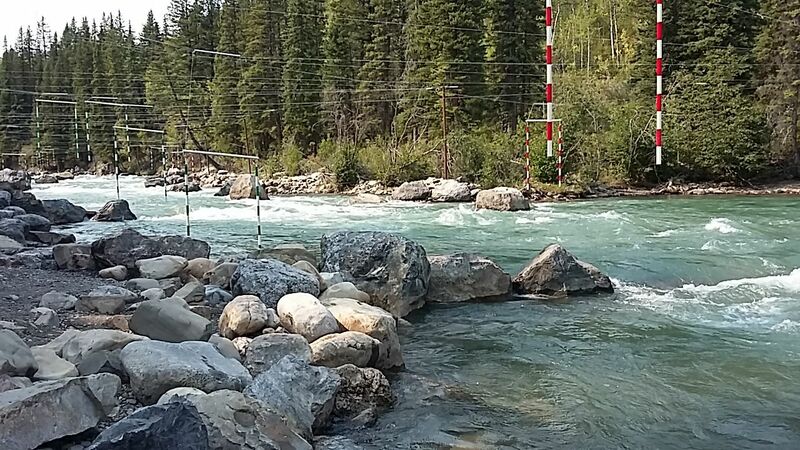 The ultimate day for this stage was an exhilarating 10km trip down the grade 2-3 Kananaskis River, from the slalom site, through Canoe Meadows to the take out above the hydro dam. The water level on this section is dam controlled and with a release of 33 cubic meters per second it made for a fantastic finale to our kayaking package. The river was fast and unforgiving with features that could and did swallow both kayak and paddler whole, however our three days paddling prior gave participants the confidence to attack the river and in most cases avoid any unnecessary inspections of the river bed. We completed the journey in a little less than two hours due to the speed of the water and after a quick bite and a cold drink it was back to the start for a re-run before returning to the hostel for a late evening meal but it was most definitely worth it. Smiles all around! After a good night sleep, a hearty breakfast and a steady start to the morning giving participants a chance to recover we started the mountaineering phase with a gentle 16km leg stretch into Johnstone Canyon past the stunning lower and upper falls and onwards to the ink pots, vivid turquoise pools of gently bubbling water. A little different to what we had experienced in our kayaks for the last four days. 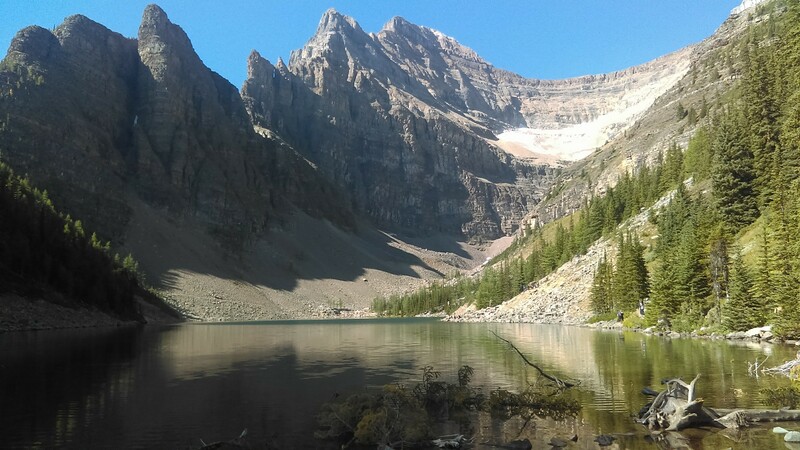 Despite the gentle incline and well-worn path, the going was surprisingly slow due to the temperature and number of fellow mountaineers sharing the trail. 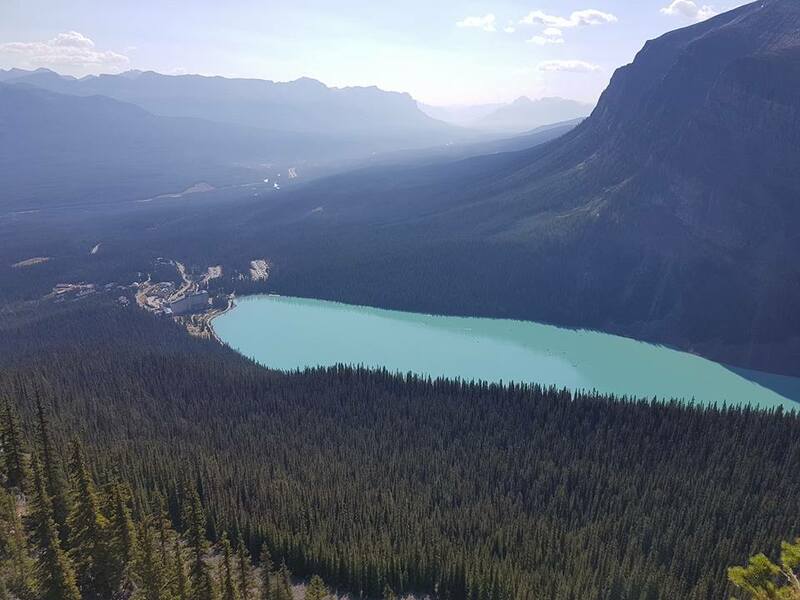 Day 2 of mountaineering took us to Lake Louise and provided some of the most spectacular views. Parking at the trail head next to the Chateau, walking around the lake and up through the pine forests led us to the summit of a mountain known as Little Beehive. 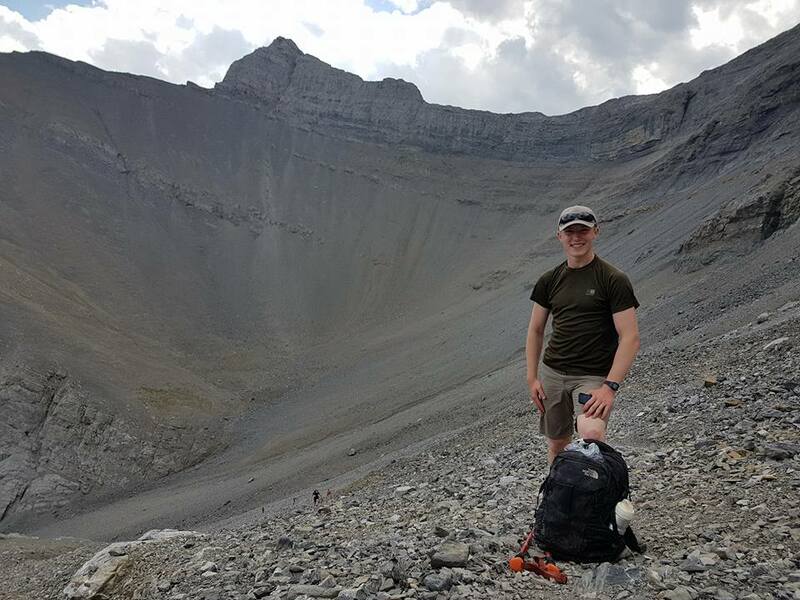 After lunch at the legendary Lake Louise tea house we headed up and over Big Beehive in a circular route leading back to the trail head and after 23km of mountaineering a well-deserved ice cream was enjoyed by all. An early start on day three took us to the top of Middle Sister at nearly 3000m. 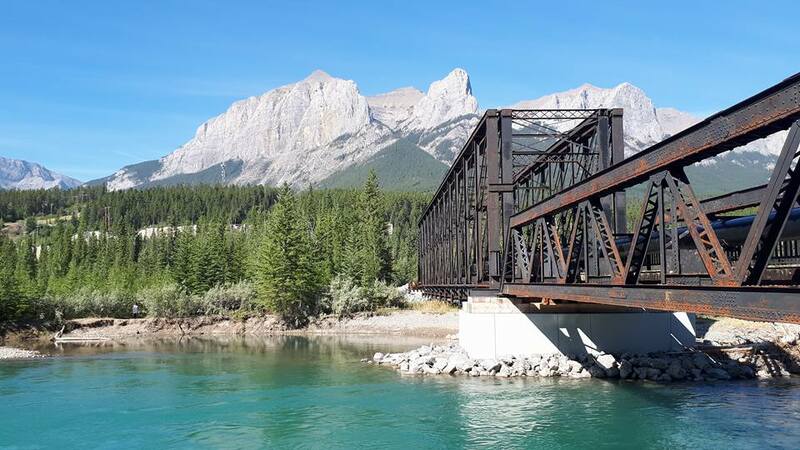 The three sisters sit at the head of the Bow Valley overlooking Canmore and the Trans Canadian highway. The route to the top took us from the parking lot, through the dense pine forests and into an empty debris filled river bed which we followed until we reached the natural bowl with a huge head wall and onto an open expanse of scree which finally led to the summit. The team eventually made their way back to the Hostel after completing a very dusty 13 hour ascent, covering a distance of 25km and gaining over 2000m in height. Shower, dinner and sleep! Need I say more? Our final day in the mountains had a more sedate feel, with tired legs the group headed to Sunshine. After a steady 5km leg stretch we arrived at Healy pass surrounded by meadows and summer flowers, a stark difference to the barren surroundings of the previous day. This provided a great place for lunch before heading on to the Standish view point and the Col at Two Cairns. 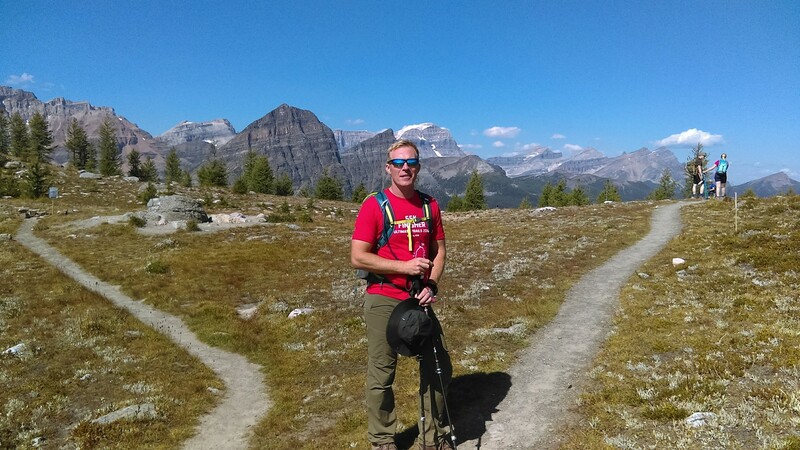 This fantastic 26km journey brought our mountaineering phase to an end at the Great Divide, the border between Alberta and British Columbia. 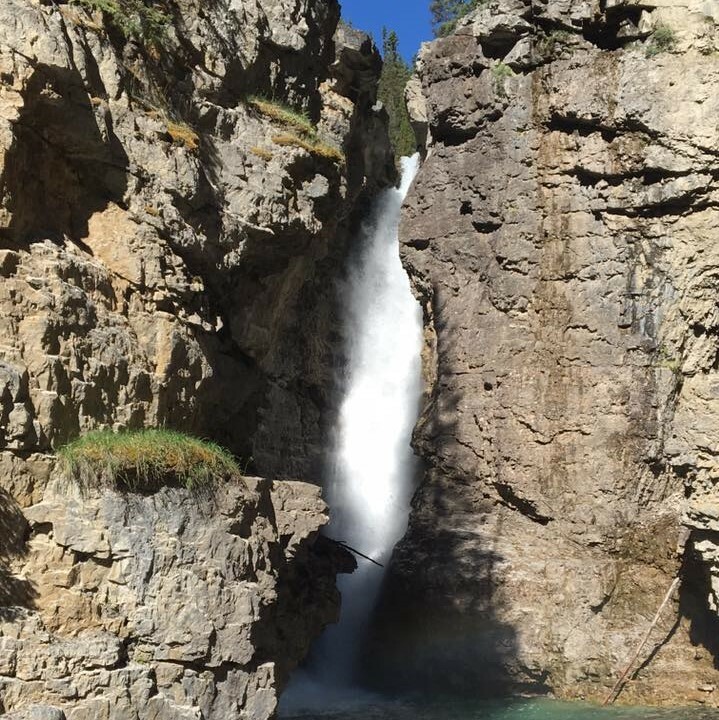 At the end of our epic eight days of adventures, with tired arms and legs and before the grand finale we decided to take a well-deserved break and head for the Banff Hot Springs in force. After soaking away the aches and with wrinkly fingers it was time for a spot of retail therapy with the girls heading for the boutiques and the lads to the gear shops, somethings never change. Followed in true mountaineering style by coffee and cake. 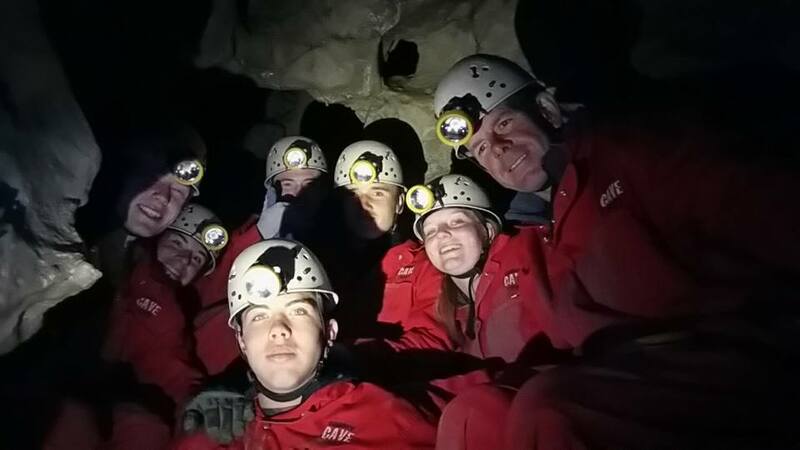 Our final day’s activity was going to prove extremely challenging for all, caving was a new experience for everyone; there was an air of apprehension and excitement that morning at breakfast. Very strange, but no one had a big breakfast, maybe they were worried about fitting through some of the tight squeezes that were to come. After meeting our guides, gearing up and receiving a very interesting brief on how the cave was formed, we switched on our head torches and hesitantly stepped into the darkness past the bones of previous occupants before descending down a 30m abseil into the abyss. We continued our journey and passed through the grand chamber, then the fun really started to begin. After a few gentle squeezes designed to settle our nerves we entered the “laundry chute”, a 3m, figure hugging chute that had a 90 degree turn at its bottom followed by a slide into a chamber before exiting onto “treacherous slab”, The cave contains a vast array of Calcite formations. Flowstone, Rimstone, Straws and of course Stalactites and Mites, but bizarrely no running water. 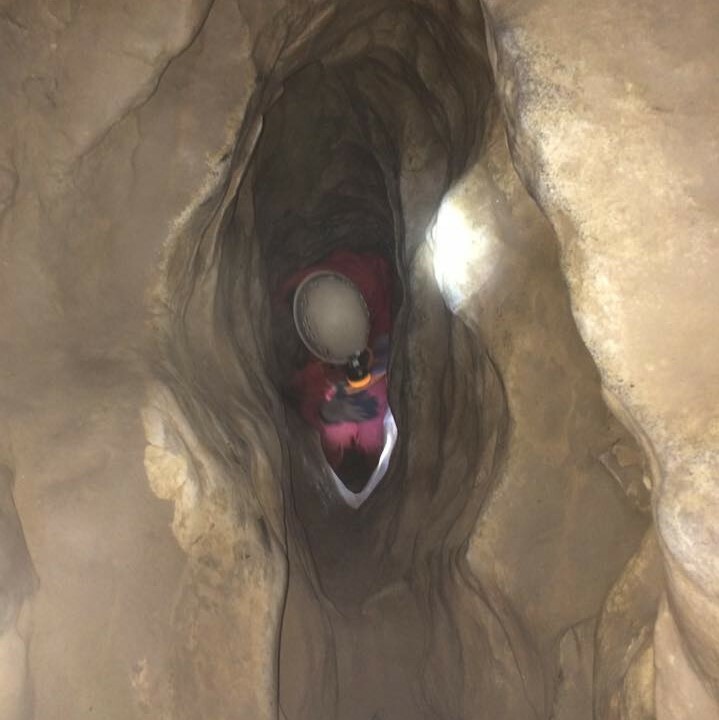 As confidence grew, we went deeper and deeper into the cave through even smaller squeezes until we were stopped in our tracks by a sump full of muddy water. We explored about 3km of the system and at our deepest point were at more than 100m vertically underground. That was the mid-point on our tour and as the saying goes “what goes down must come up”. We made our way back to the surface through a maze of differing channels providing hours of endless fun, comradery and entertainment for the rest of the team as individuals manipulated their bodies through the corridors and squeezes. 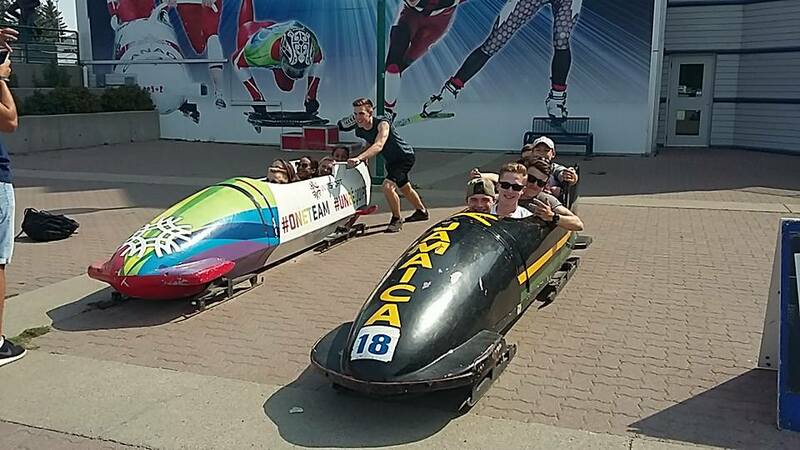 What better way to finish our expedition by visiting the 1988 Winter Olympic park in Calgary. The site is open to the public and during the summer months provides many adrenalin type activities. Having the opportunity to zip line off the 90m ski jump and crew the four man bobsleigh down the women’s Olympic run, sliding through 10 turns and reaching speeds in excess of 80km/hr and feeling the force of over 2G’s with a former Olympian at the helm. This is something that most expedition members will never forget or ever have the opportunity to do again. Our final night in Canada was spent having dinner together in a local restaurant, this provided a great opportunity to relax and exchange stories before the start of our 20 hour journey home to Stafford. We set off with the aim of exposing our Cadets and CFAV’s to the Canadian environment and culture which we certainly have done, but more importantly we forged them together as a team, inspired and challenged them, whether it be teaching participants how to cook, how to use a washing machine or crawling through confined spaces below ground. The expedition has at every stage developed individual’s self-discipline, courage and determination; we departed MOD Stafford with a group of reliant self-centred individuals and returned with a team of independent, confident and socially adept young adults. 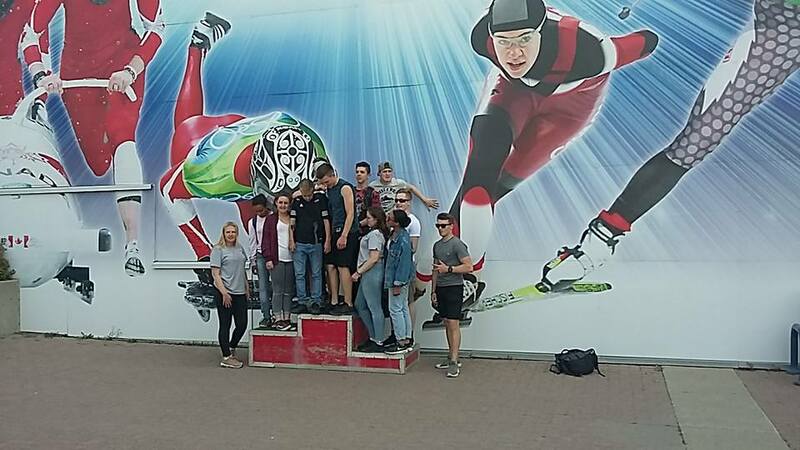 Staffordshire and West Midlands (NS) Army Cadet Force and the expedition members would like to thank you for your very kind donation, it has without a doubt helped to provide the participants with an opportunity of a lifetime that they will never forget.